The Turkmen states of medieval Anatolia (11th-14th centuries) ruled areas which had formerly been under Byzantine governance. Though the Turkmen leaders and many of their troops were Muslim, there were also large Christian and Jewish populations living in the areas under their rule. Their coinage is remarkable for its blending of Christian and Muslim imagery and its re-use of older (sometimes much older) images from Byzantine, Roman and even Hellenistic coins. 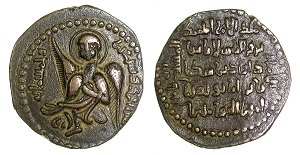 It is unclear where Turkmen coins were minted or how prototypes were located to provide models for new designs, but this example, showing on the obverse the angel Gabriel and on the other an Arabic inscription, is typical of the fusion of traditions represented.